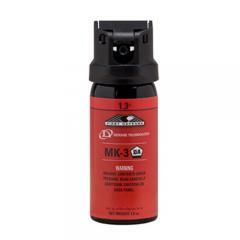 The most widely used OC spray by law enforcement? Defense Technology's First Defense® MK-3 1.3% Red Cone which conveniently clips to a duty belt for ultimate self-defense protection. The intense, 1.3% Major Capsaicinoid formulation is Def-Tec's strongest to date and is EDW safe as well as nonflammable. The canister delivers 10-12 short bursts with a maximum effective range of 10-12 feet. The powerful cone spray pattern allows for more accurate coverage of targets in a wider area. The spray is recommended for tactical teams requiring immediate action with decontamination and cross-contamination options in place.